“Working at the ADAcafé, dad has become less agitated, he even makes curry puffs for the family, at times,” said Eric, Henry’s son. Henry is 75-years-old. He was diagnosed with early stage Alzheimer’s Disease in 2016. Despite his condition, Henry remains highly independent. A former church volunteer, taxi driver, and school janitor, among the many other jobs he held, Henry had not been engaged in gainful occupation and employment, since retiring two years ago. He stayed at home most of the time. Communication issues and friction within the family soon arose. However, Eric observed a change in Henry, who has become more light-hearted and jovial, since he started attending the Family of Wisdom (FOW) sessions at the Alzheimer’s Disease Association (ADA) and helping at the ADAcafé. ADA started the FOW programme about 3 years ago. 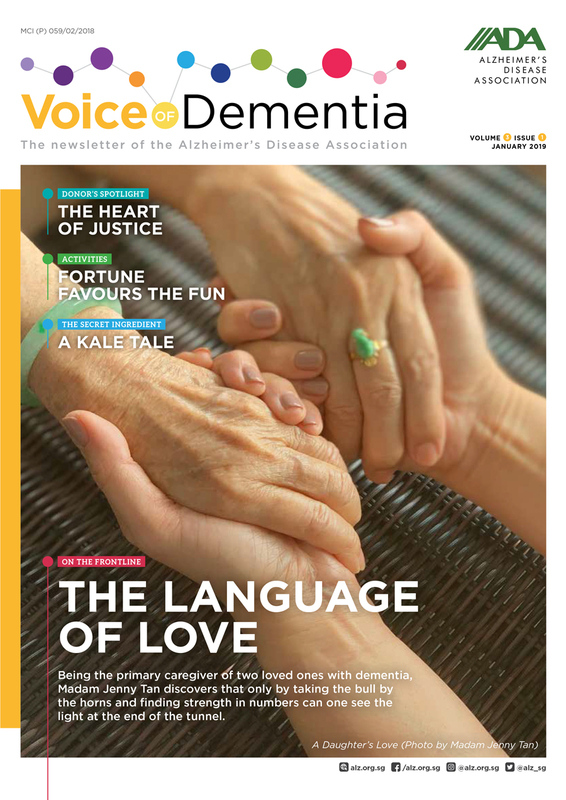 It is modelled after FOW in Taiwan and seeks to provide a continuum of community care for persons with dementia through shared caregiving and mutual self-help among caregivers, which also allows them to have some respite and emotional support. An extension of ADA’s New Horizon Centres, and Caregiver Support Centre programmes, FOW complements a full-day dementia programme with shorter hours, through social and interactive activities. It provides another service for persons with dementia and their caregivers. Jointly run by care staff, caregivers and volunteers, a group of persons with dementia and their caregivers gather regularly to take part in cognitive- stimulation activities such as games, craftwork, painting and cookery, physical maintenance and individualised activities. One client who has benefitted from the FOW programme, Henry, attends these sessions regularly. To slow down the deterioration of his condition, Henry’s doctor suggested for him to work. Henry now goes to the ADAcafé @Agape where he helps serve, clean and chat with customers between 9am and 4pm, every Monday, Wednesday and Thursday. The ADAcafé aims to provide job training and possible meaningful employment for clients with young onset and early stage dementia, while also creating greater community awareness of persons with dementia. The Café, which embodies a ‘Food for a Cause’ concept, serves breakfast and lunch. A typical lunch menu consists of items like Ebi Prawns and Rosemary Chicken with garlic rice or pasta. The ADAcafe also serves a ‘Today’s Special’ with options ranging from seafood linguine to curry chicken. Pastries, sandwiches and sides such as sweet potato fries, onion rings and garden salad are also available, ala carte. Ms Eunice Tan, who manages the Café, said that there are plans to add more items to the menu and the possibility of exploring local dishes. 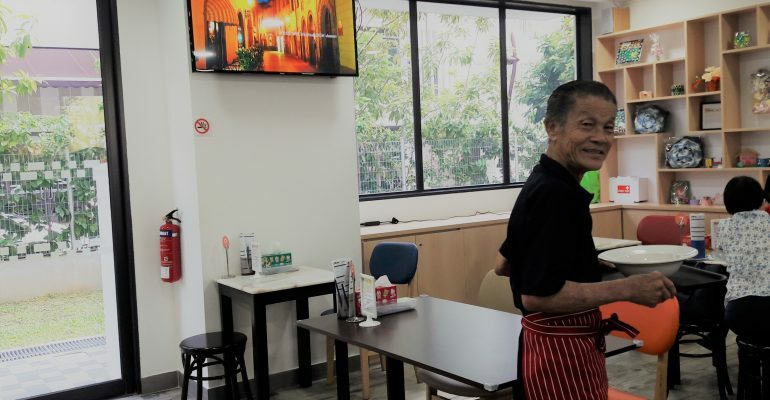 Mr Jason Foo, Chief Executive Officer of ADA, shared that the idea of the café was derived from years of observing some clients, who, in their early stage of dementia, offered to help with simple food preparation. He noticed that they were happily cutting vegetables and the activity seemed to bring back their fond memories of their roles as wives and mothers. Mr Foo explained that the ability to continue working enables clients to feel validated and lead dignified lives. The concept café provides an opportunity for employment but also serves as a form of therapy which gives a sense of security and purpose to clients. 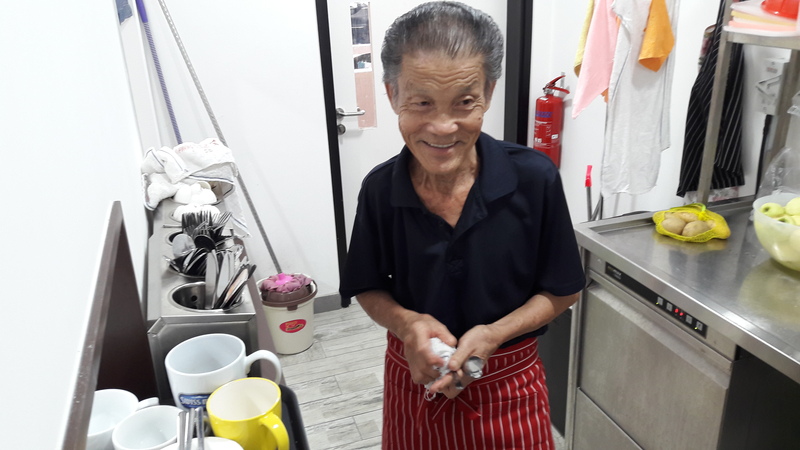 Senior Programme Executive for FOW, Ms Chong Ying Ying, said that having Henry help out at the ADAcafé provides him with an opportunity to work beyond the debilitating condition so that his remaining abilities do not go to waste. 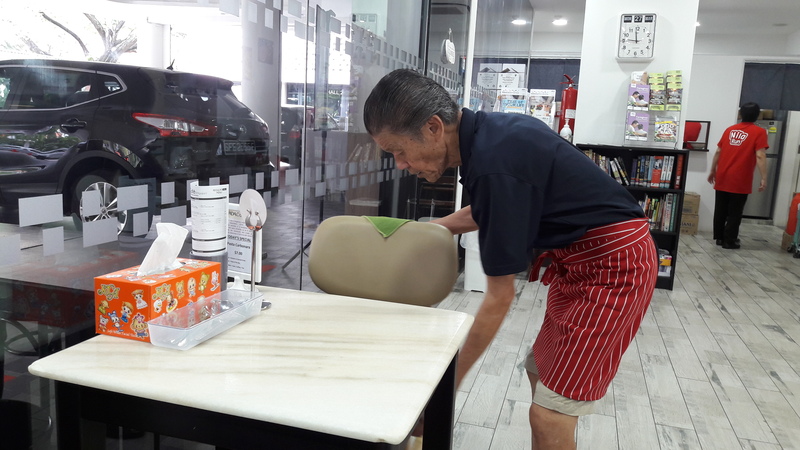 With the growing number of people living with dementia in Singapore, ADA hopes to provide activities with meaning in a dementia-conducive environment where persons with dementia can continue to make meaningful contributions to society based on their interests and strengths, like Henry. Let’s Recycle and Create Together!